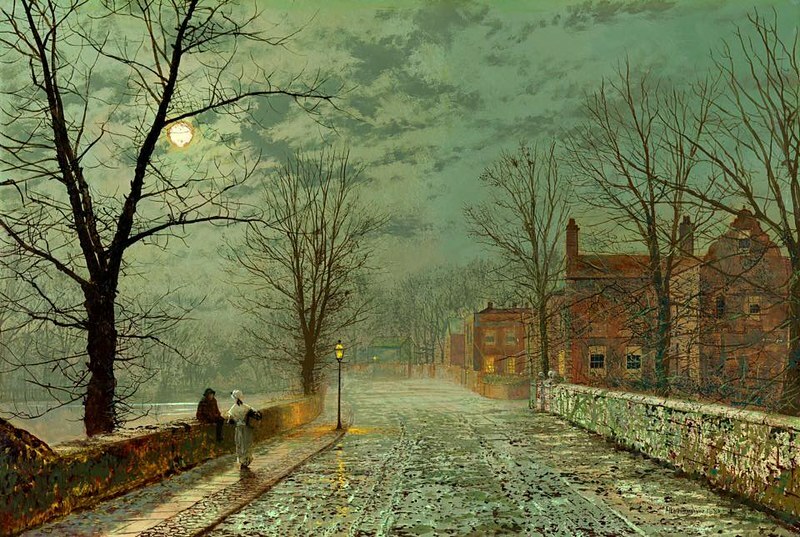 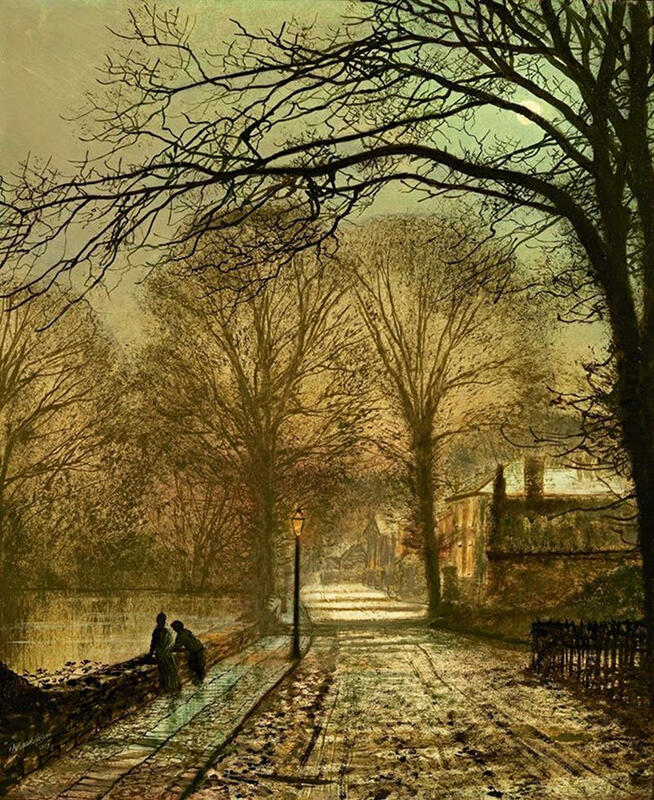 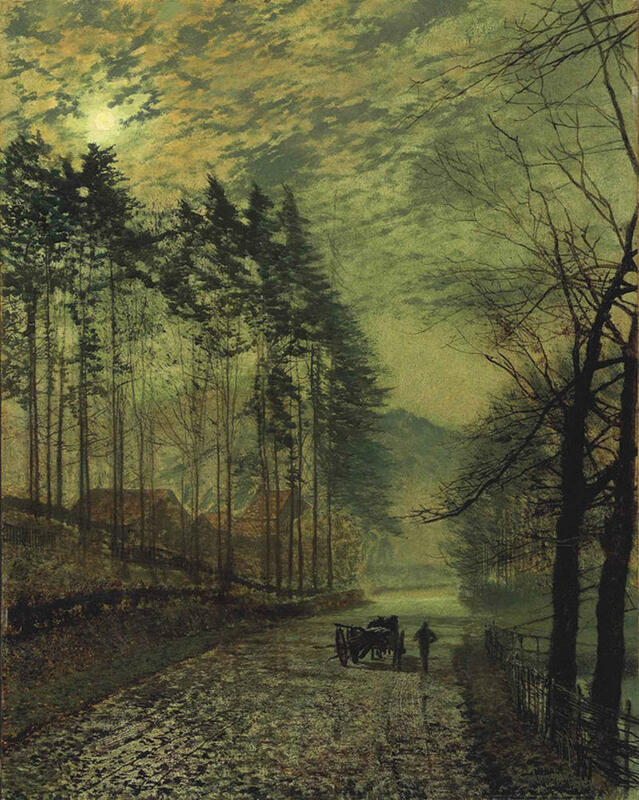 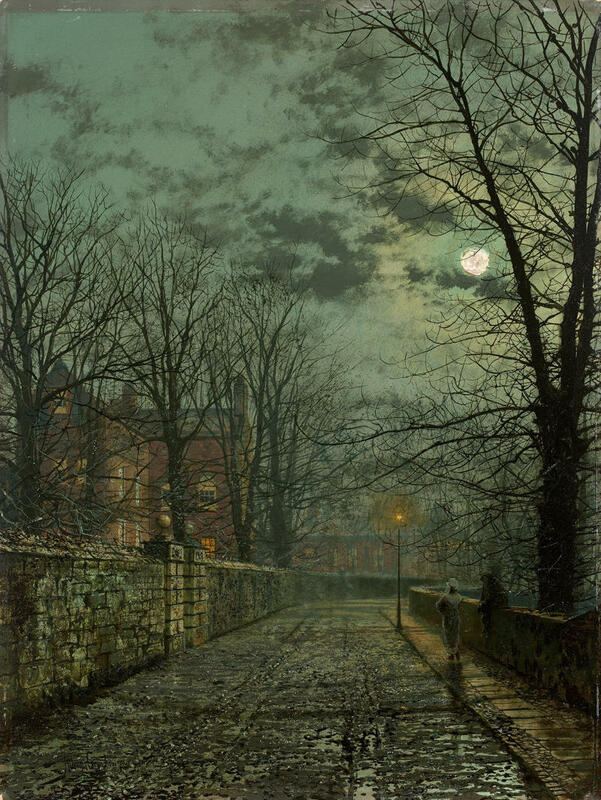 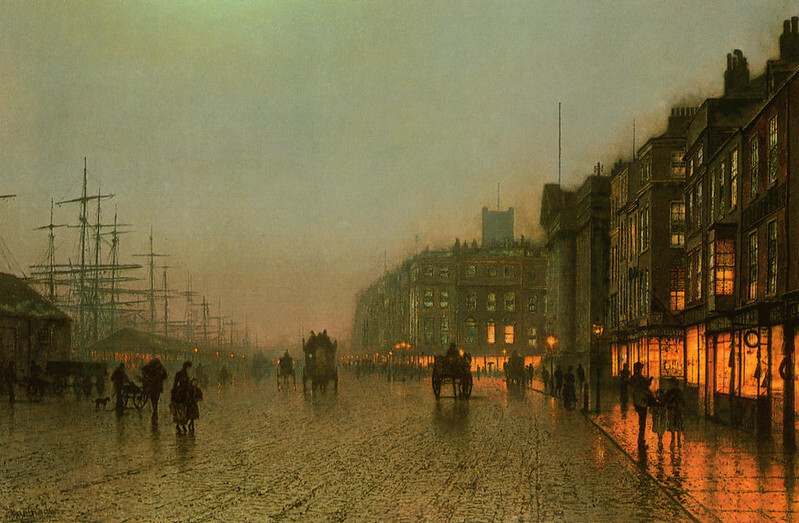 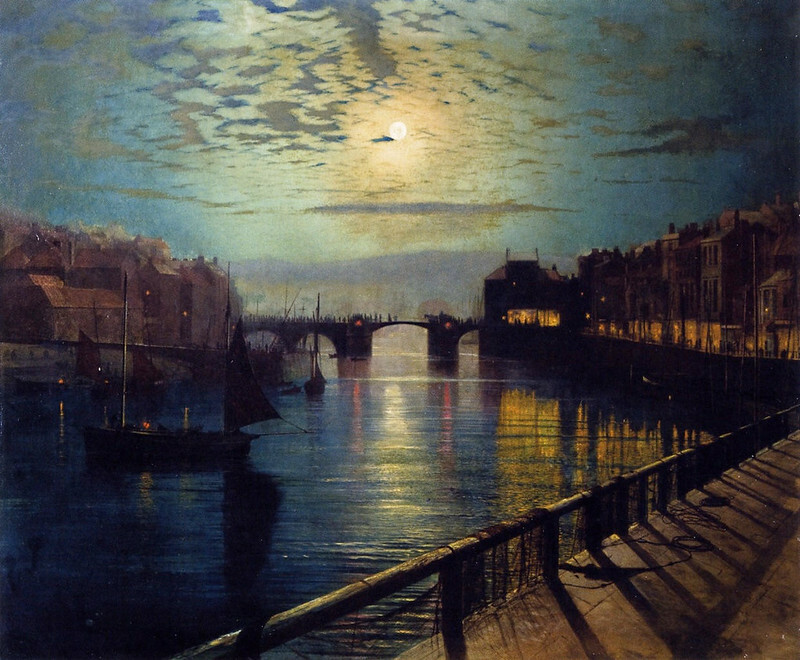 Known for his city night-scenes and landscapes, John Atkinson Grimshaw was a Victorian artist described by British art historian Christopher Wood as a “remarkable and imaginative painter”. 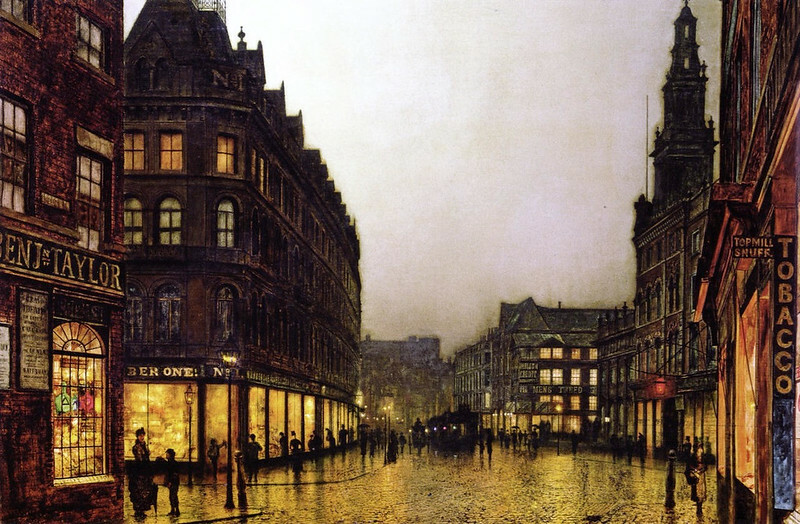 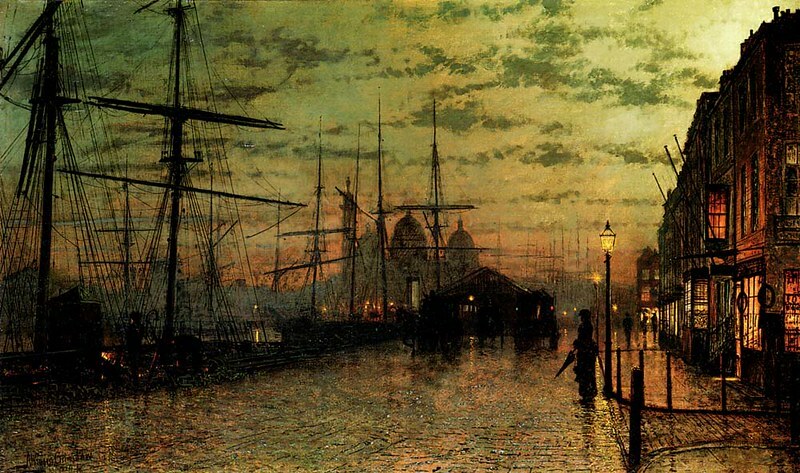 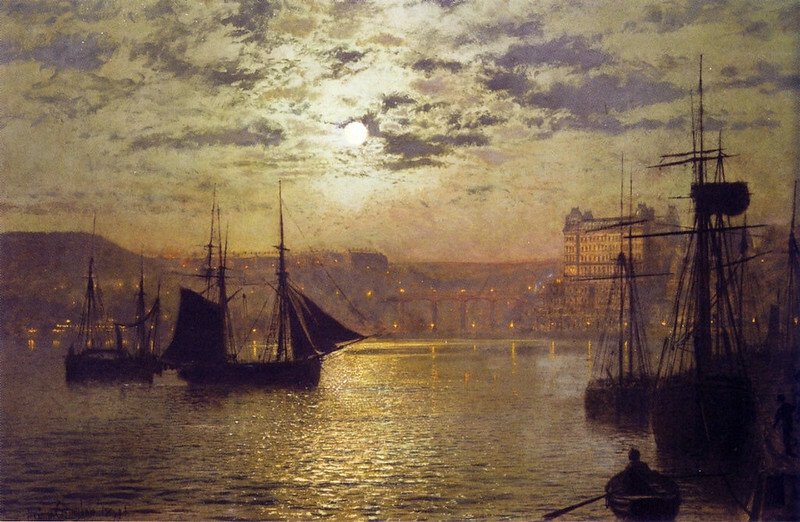 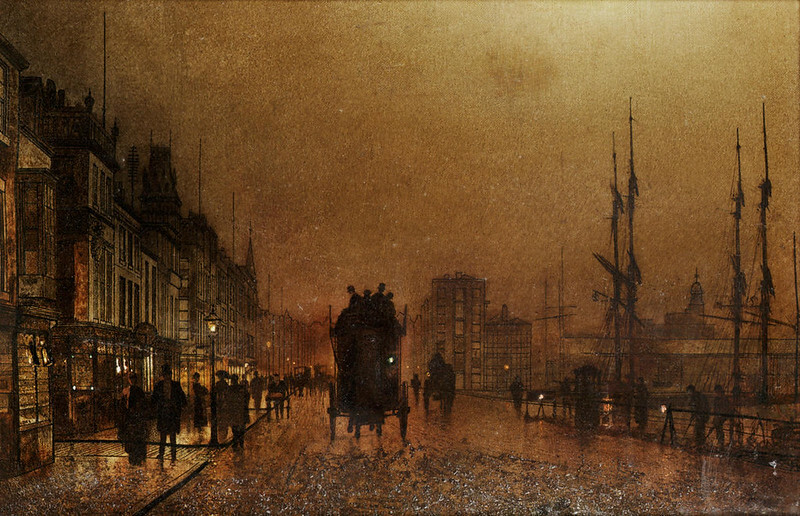 Hailing from Leeds in England, Grimshaw’s first job was as a clerk for Great Northern Railway. 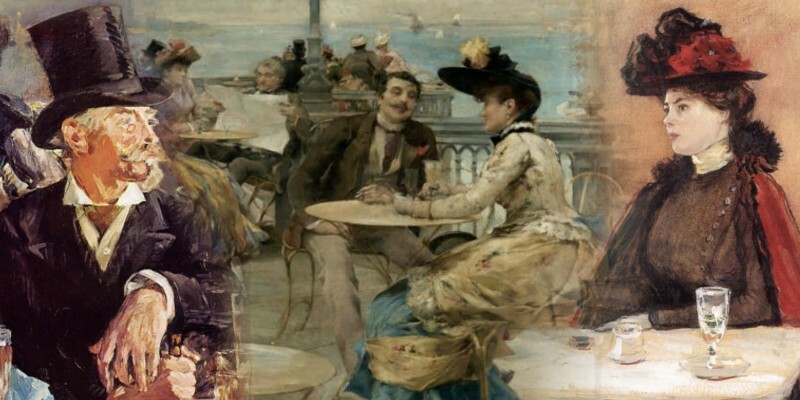 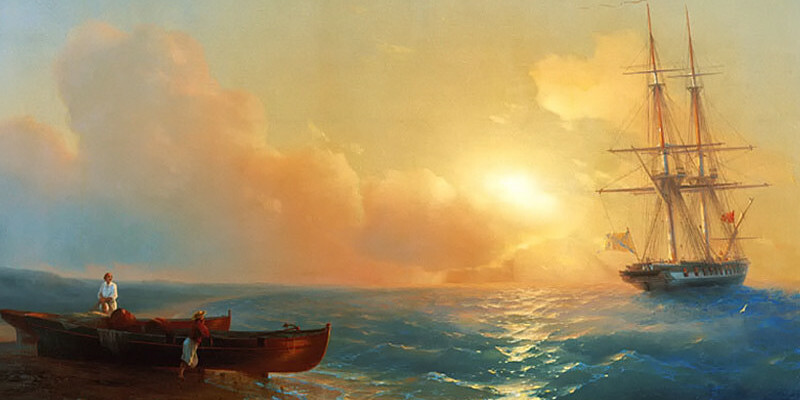 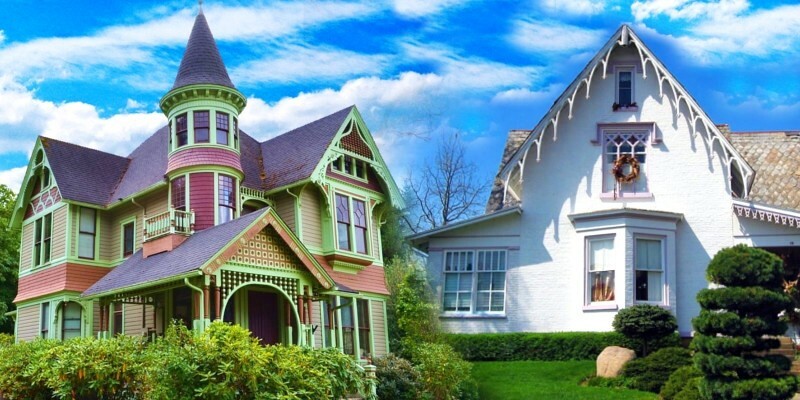 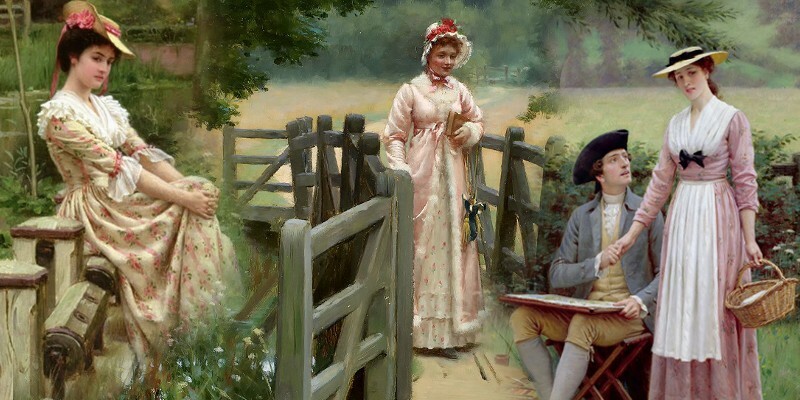 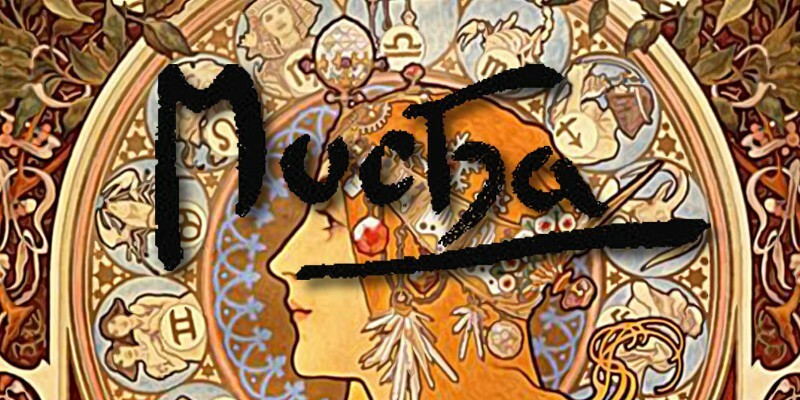 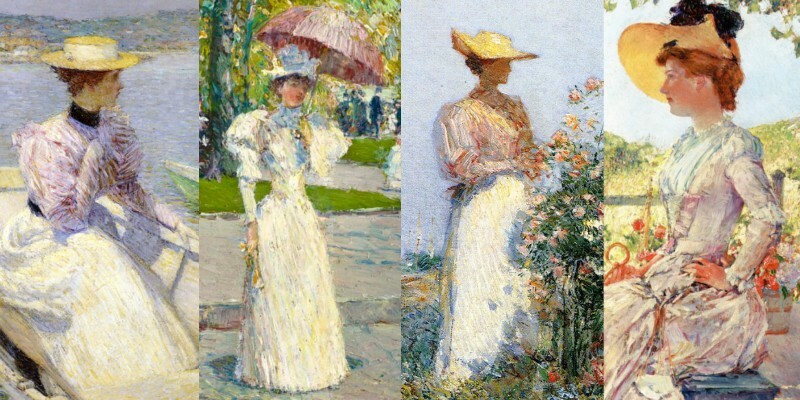 Much to the dismay of his parents, he left the job at age 24 to pursue a career as a painter. 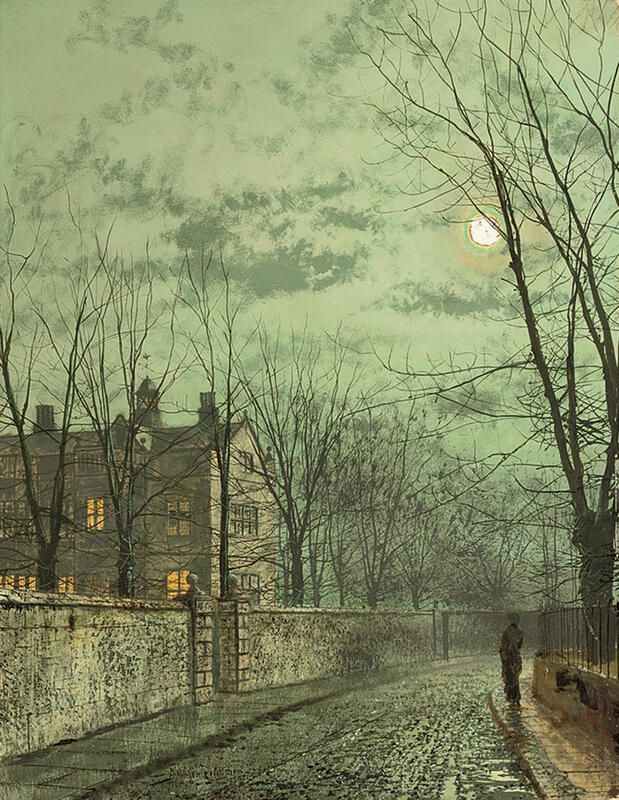 Leaving a steady job with a growing industry must have seemed foolhardy, but Grimshaw’s passion and talent for art were all he needed to make a success of his life. 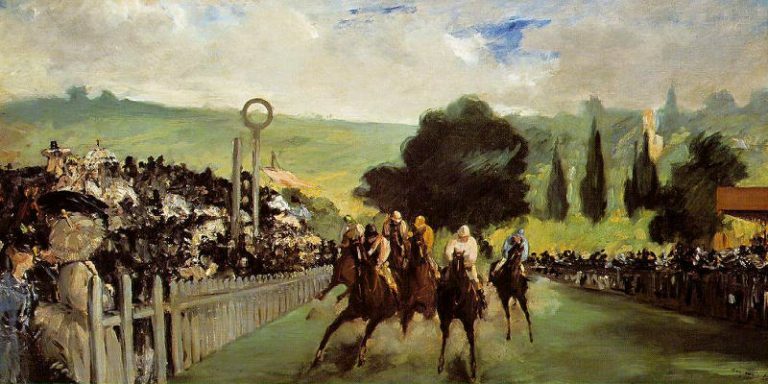 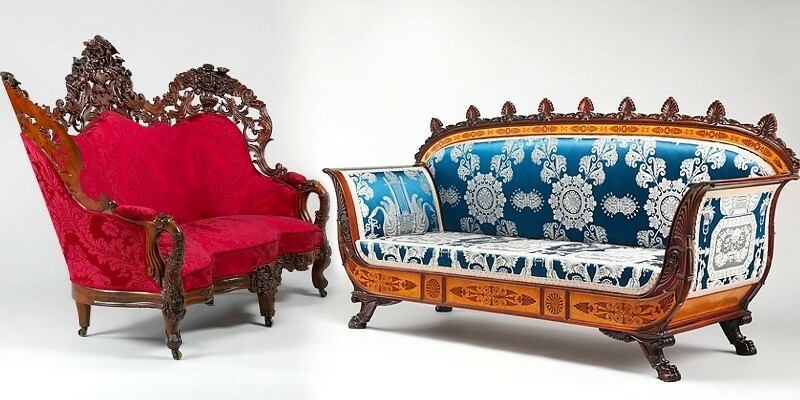 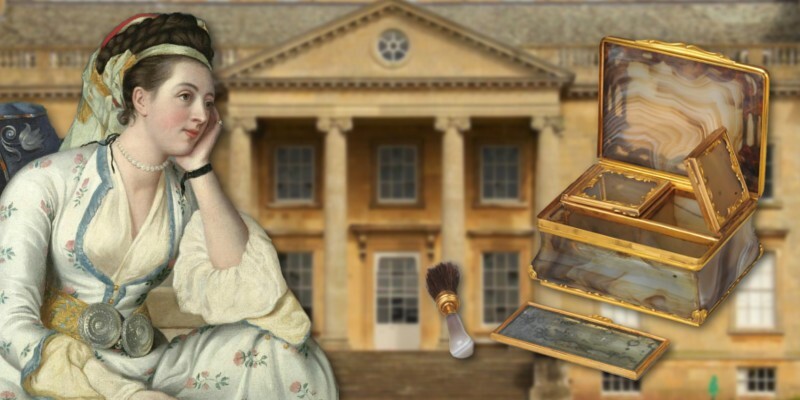 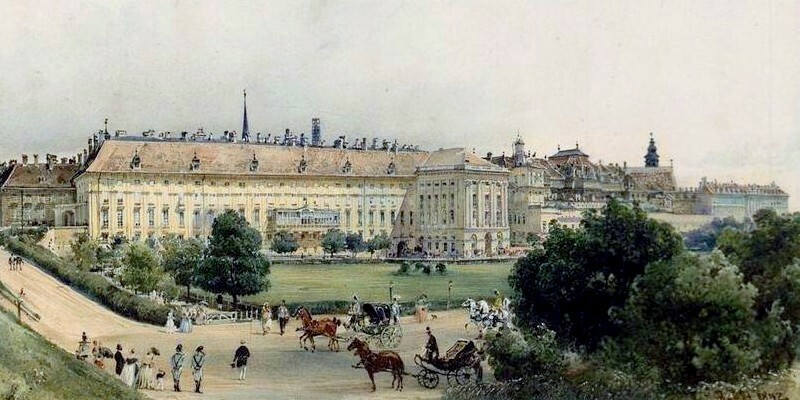 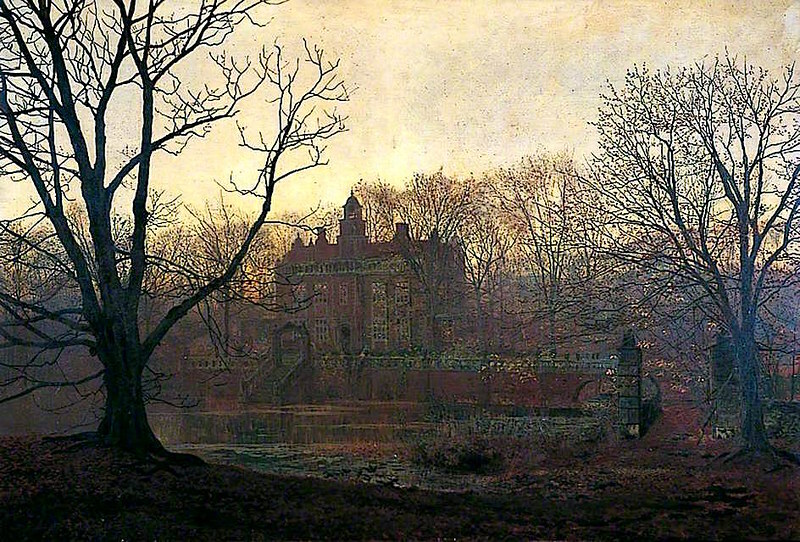 Exhibiting for the first time just a year later under the patronage of the Leeds Philosophical and Literary Society, he showed paintings of birds, fruit, and blossom. 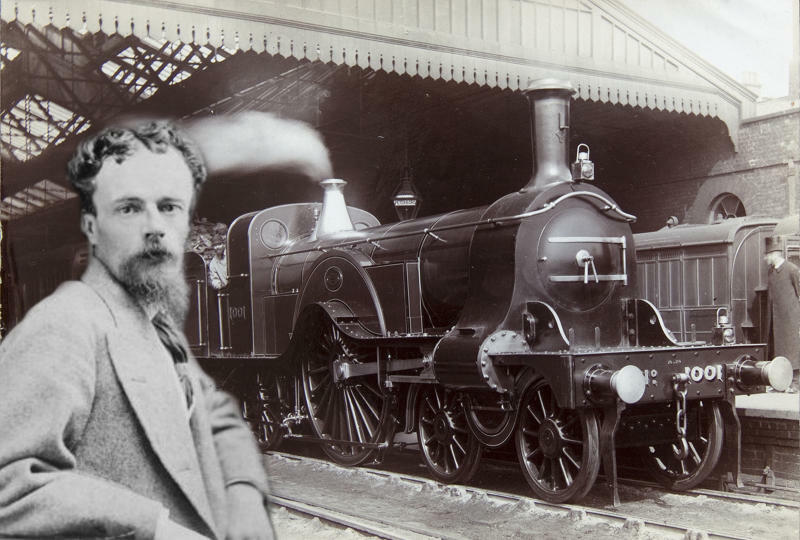 It wasn’t until the 1870s that his career really took off. 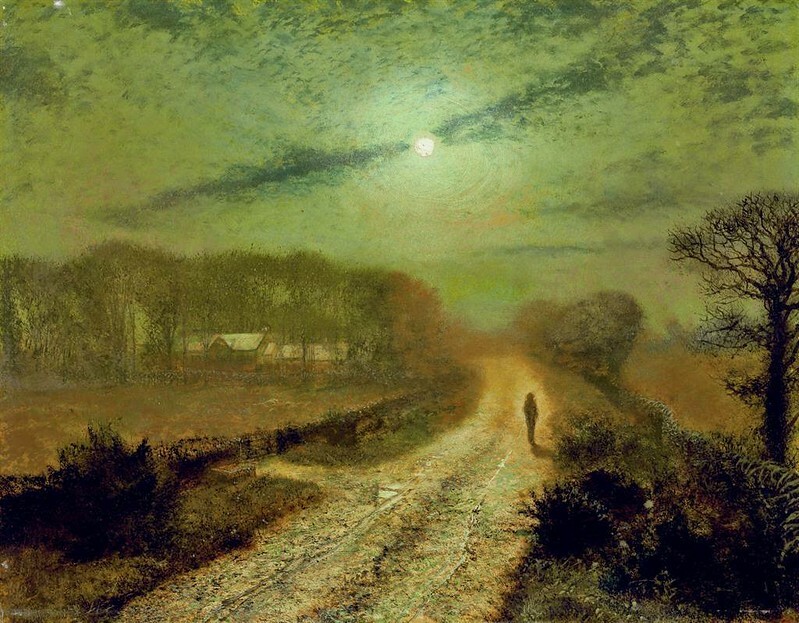 Influenced primarily by the Pre-Raphaelites, he painted landscapes with precise use of colour and lighting, often focusing on the changing seasons or the weather to bring vivid detail and realism to his work. 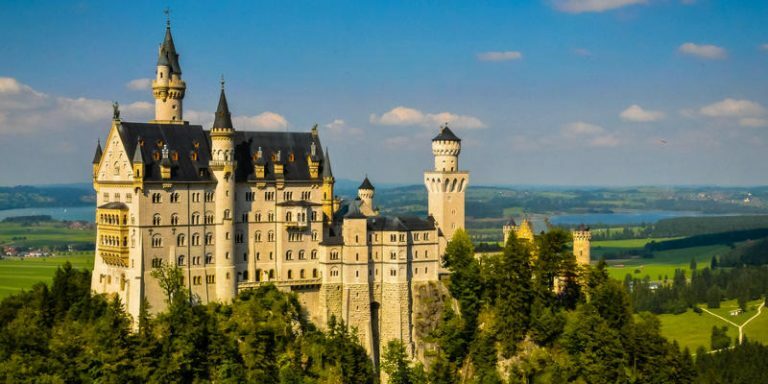 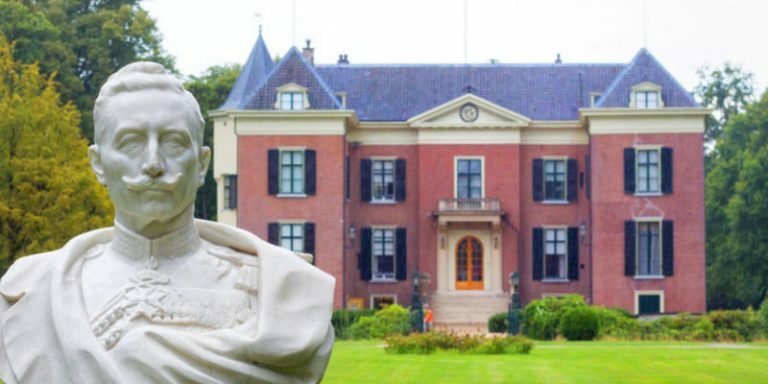 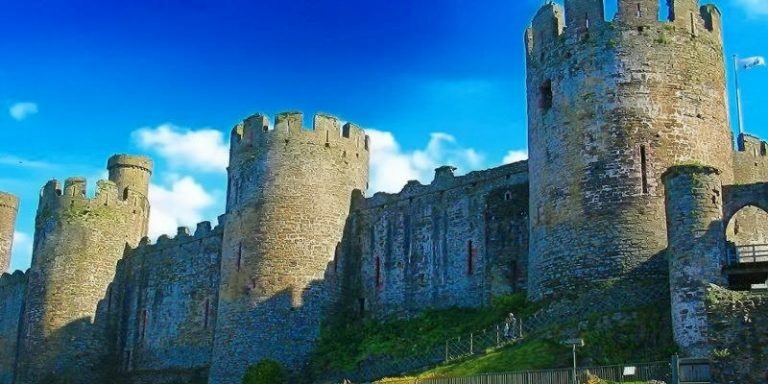 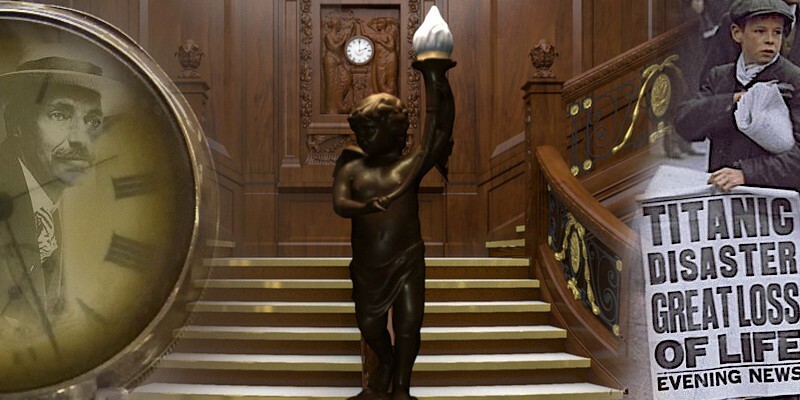 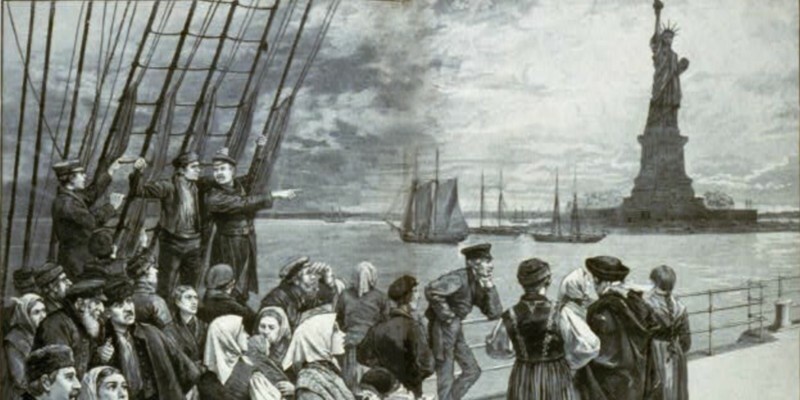 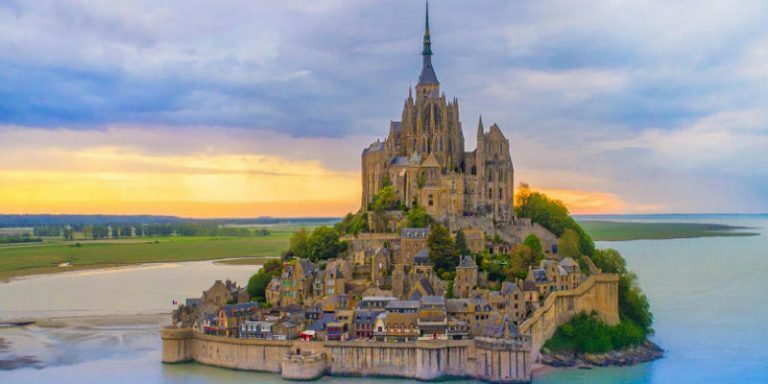 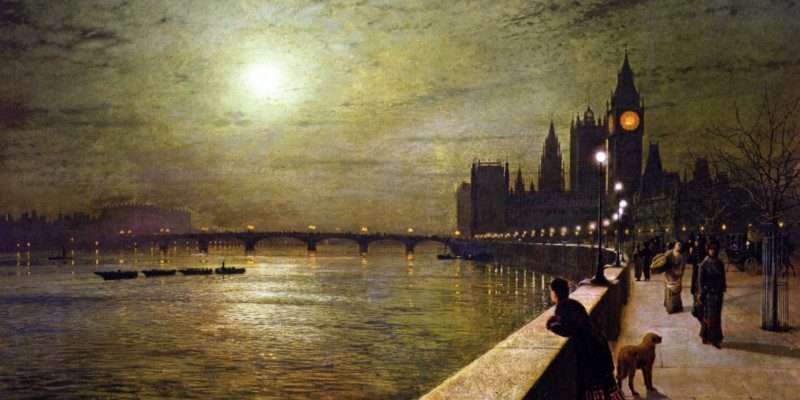 But it is the moonlit views of cities and suburban streets, of Docklands in London, Hull, Liverpool, and Glasgow that he is best remembered for. 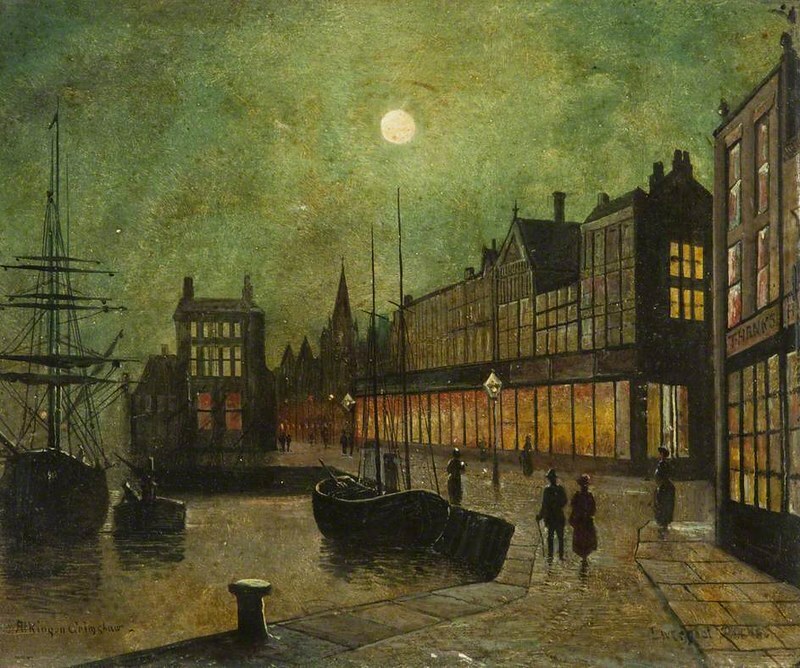 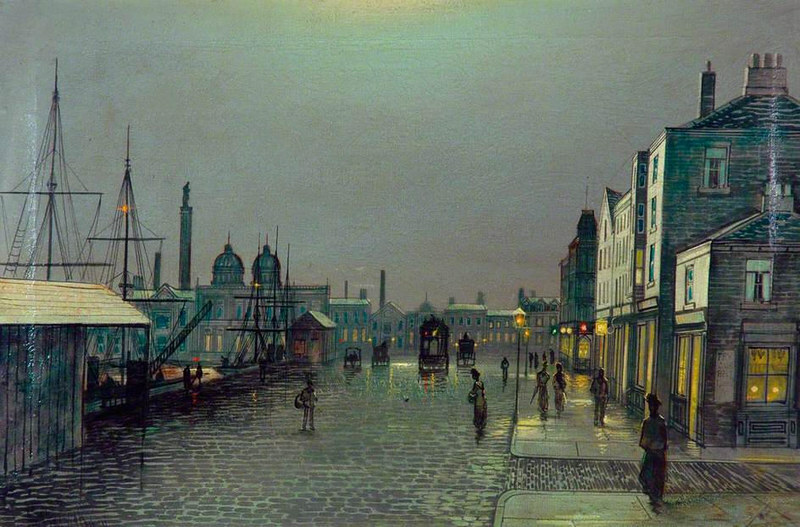 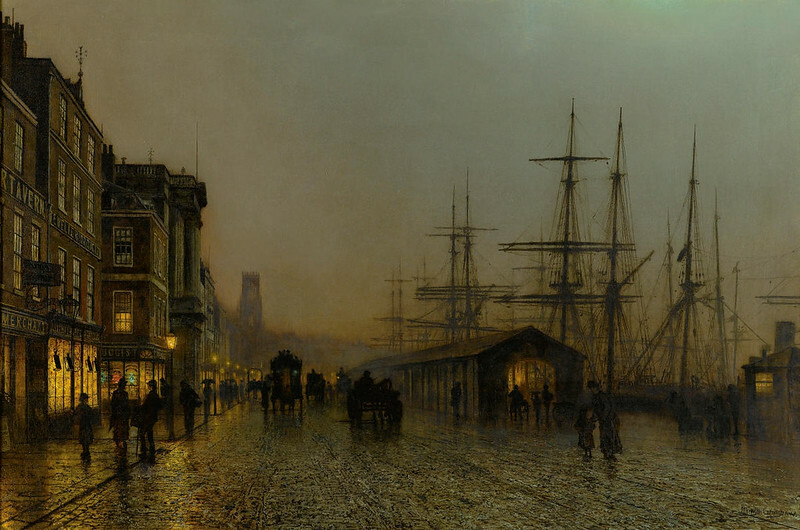 paintings of dampened gas-lit streets and misty waterfronts conveyed an eerie warmth as well as alienation in the urban scenePhilip J. Waller. 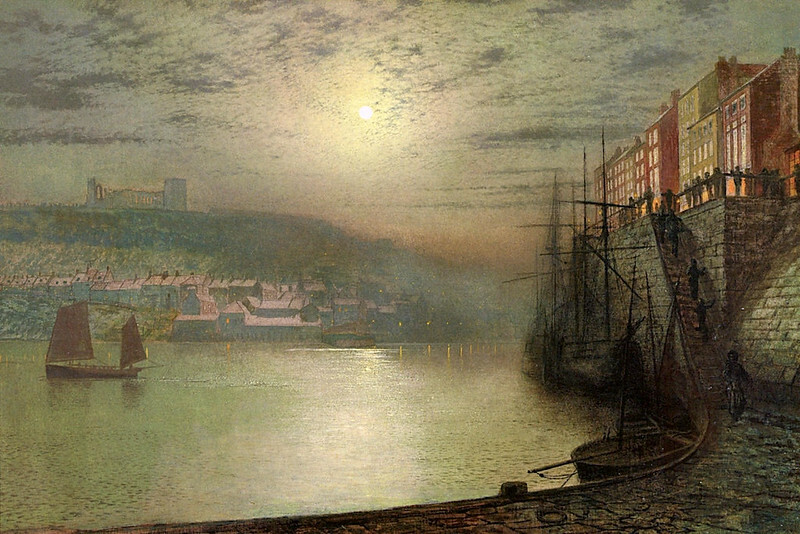 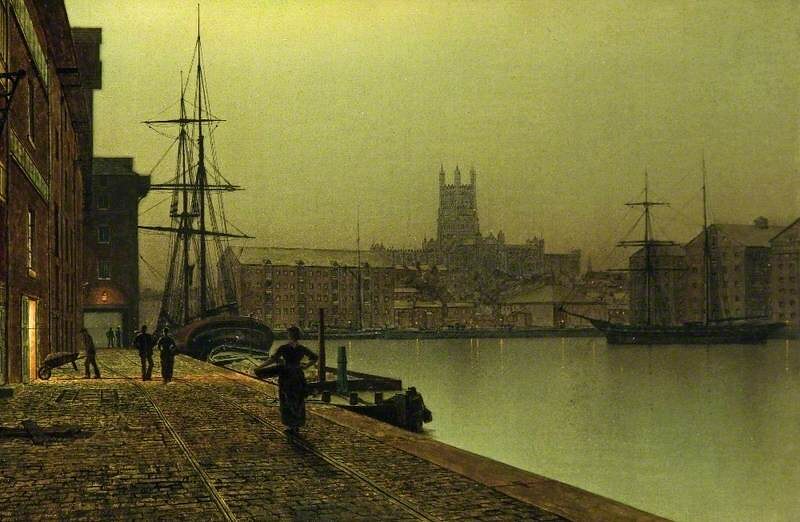 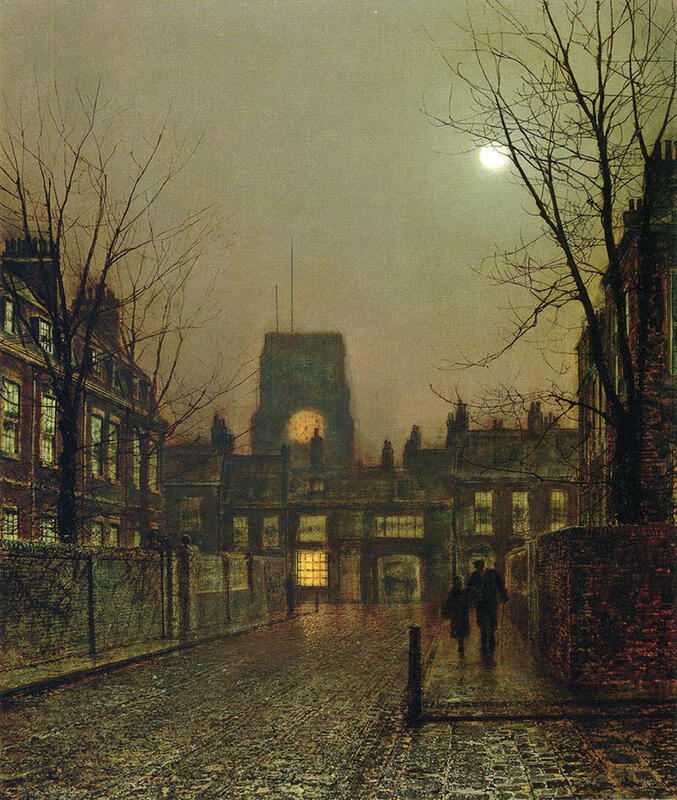 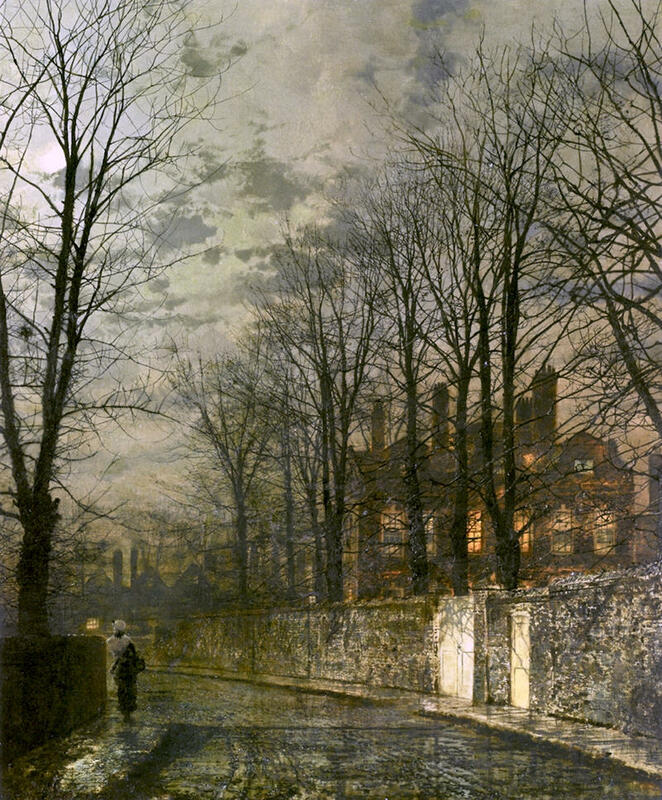 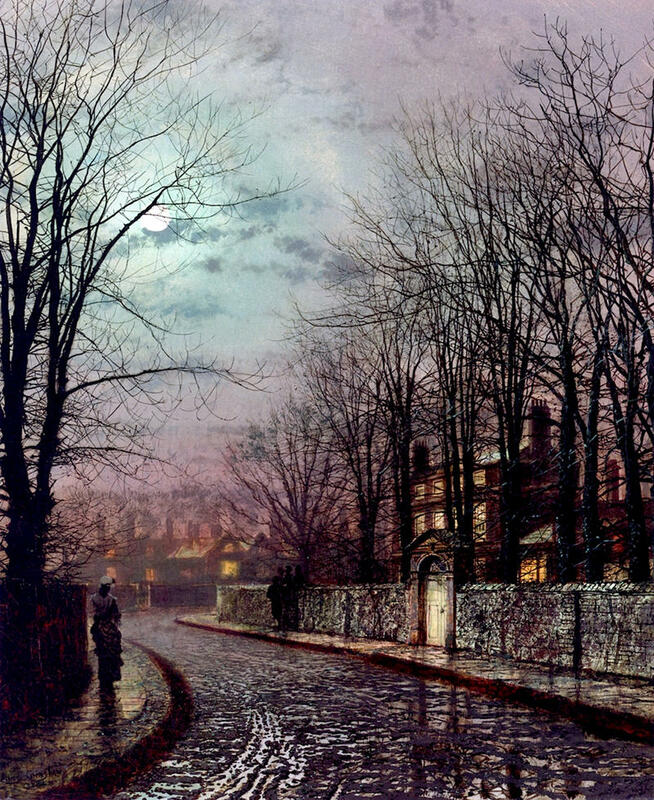 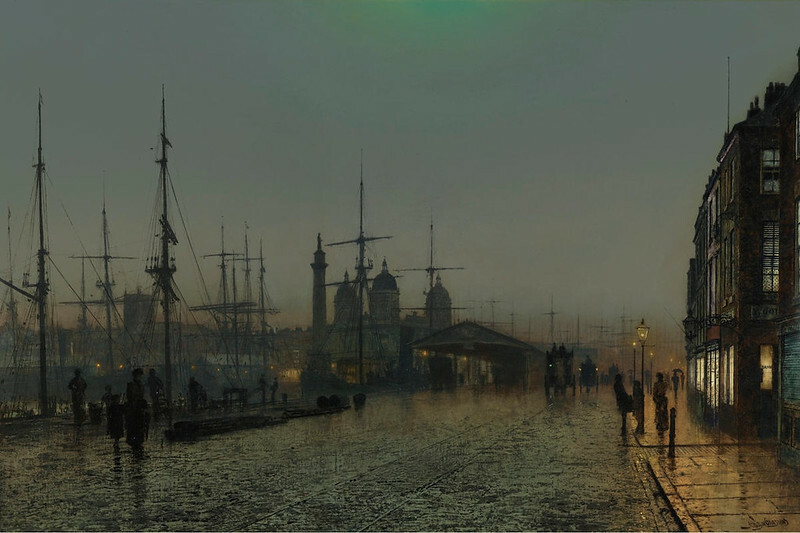 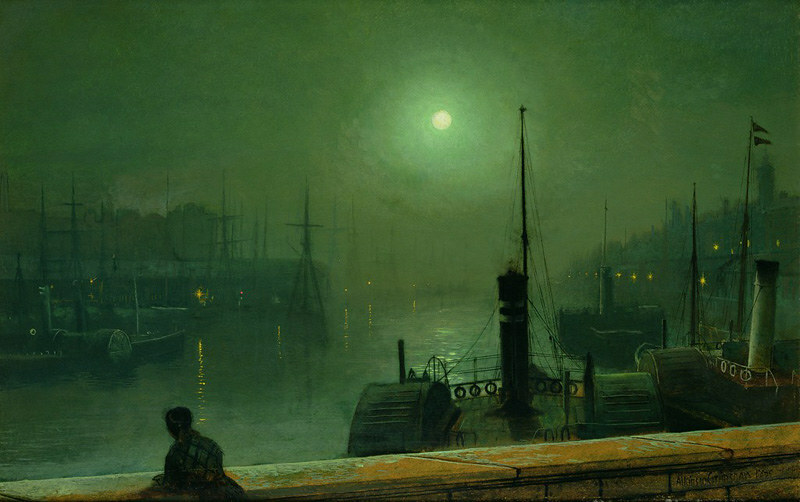 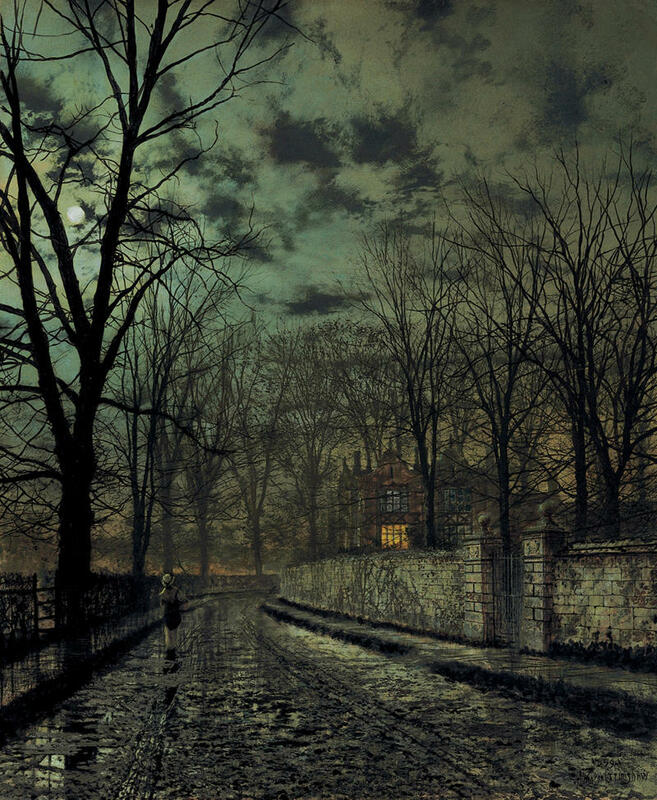 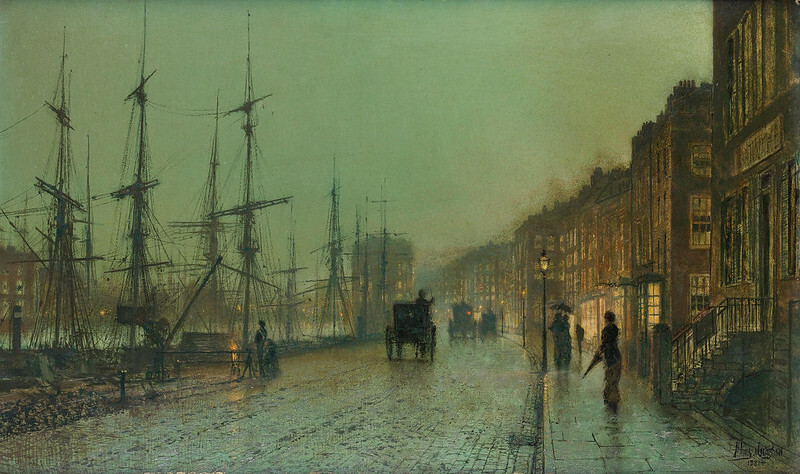 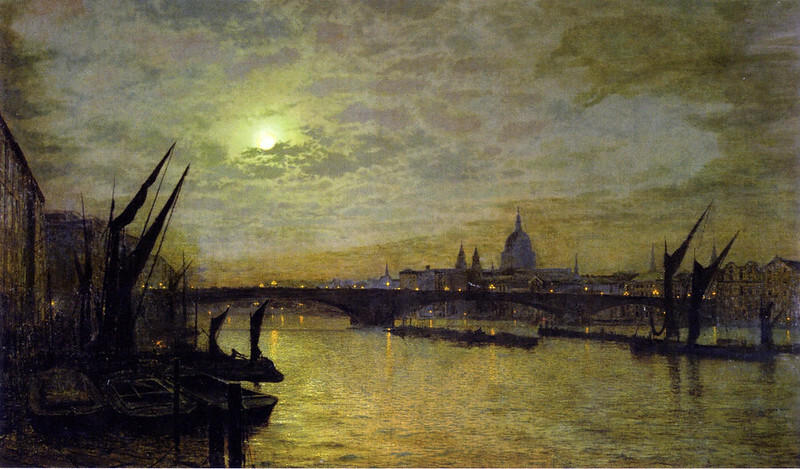 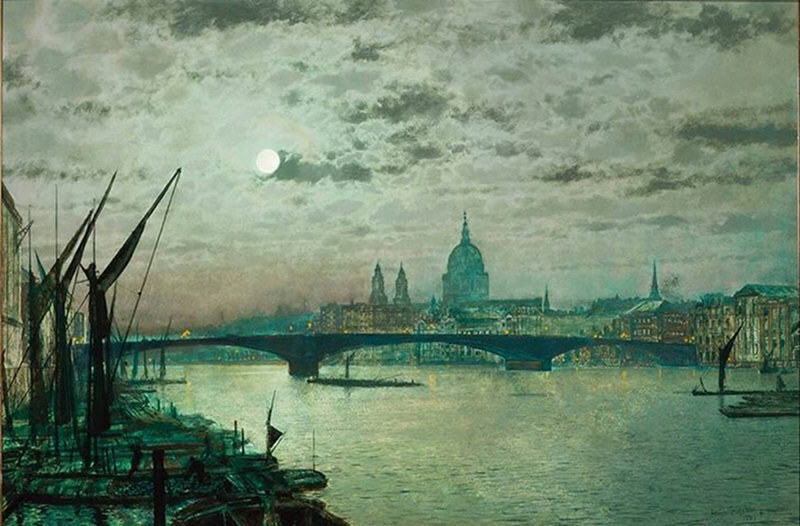 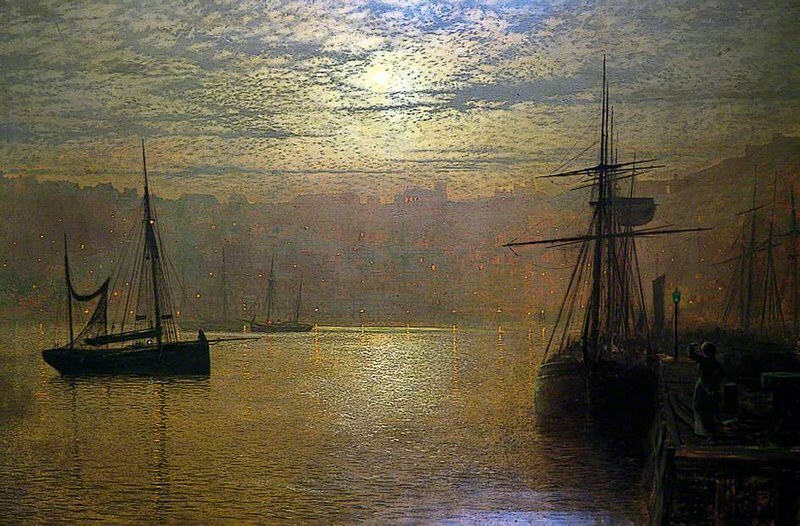 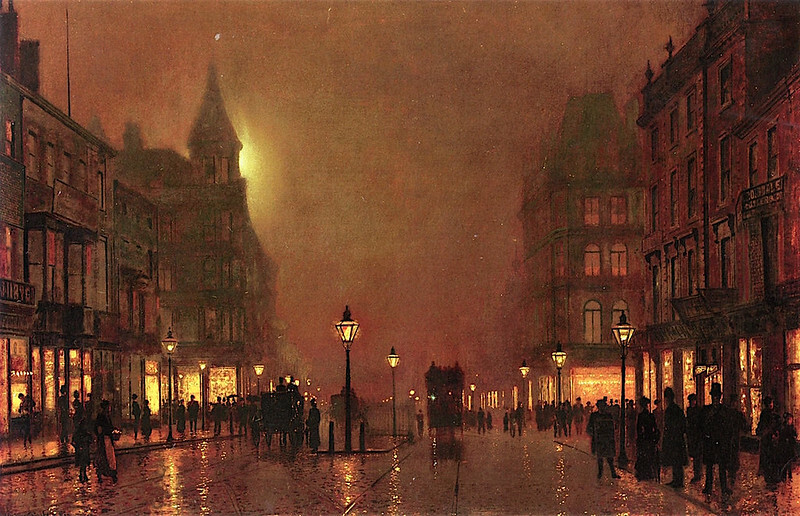 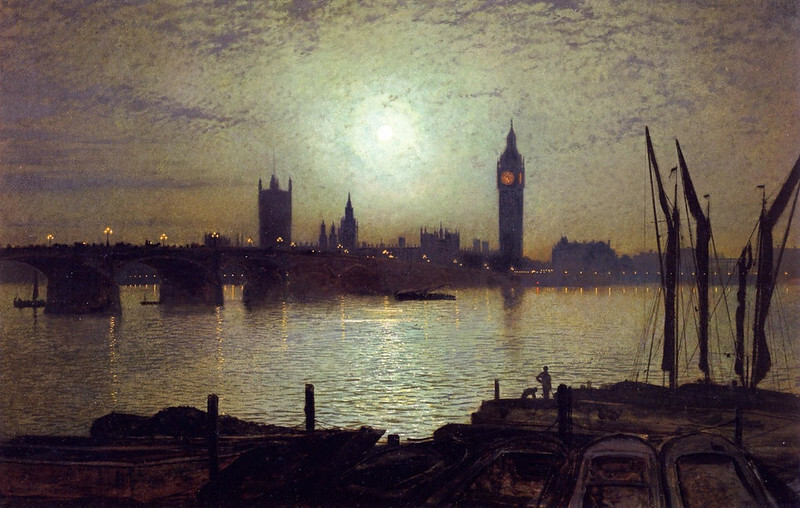 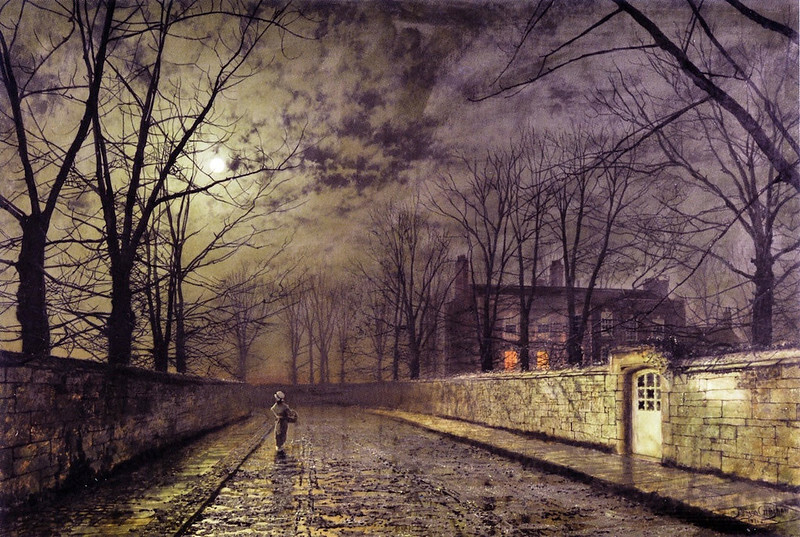 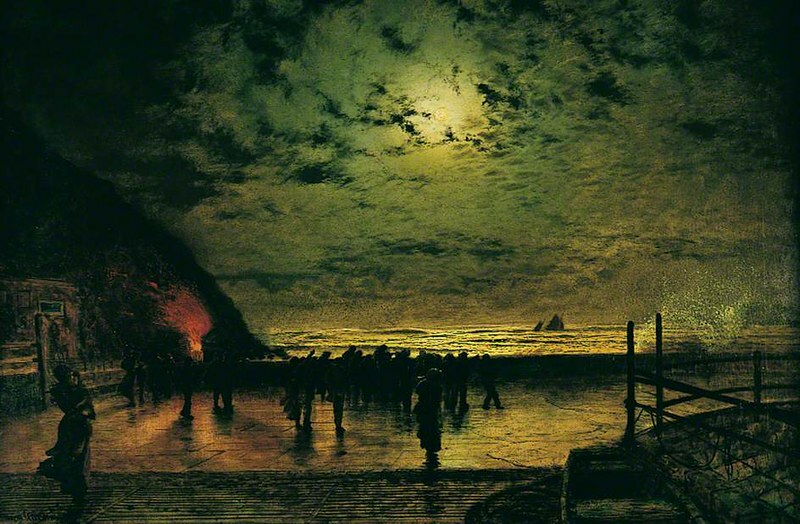 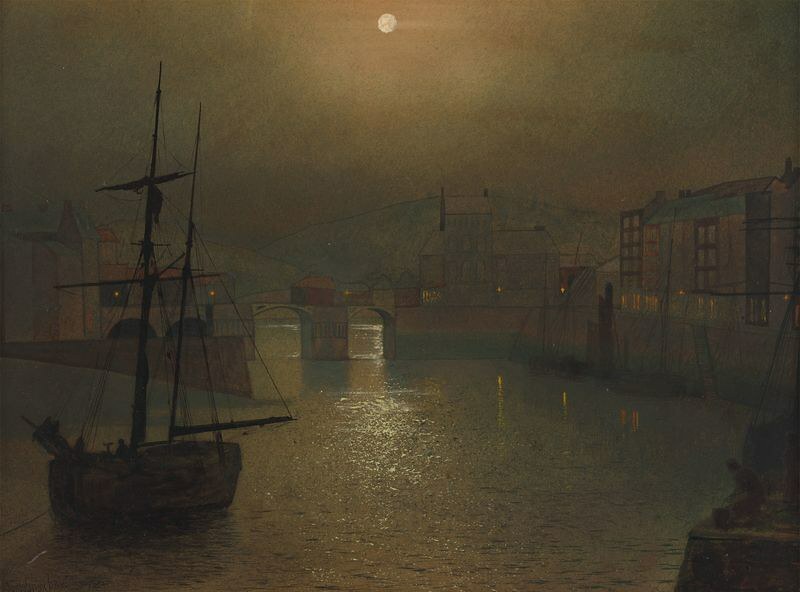 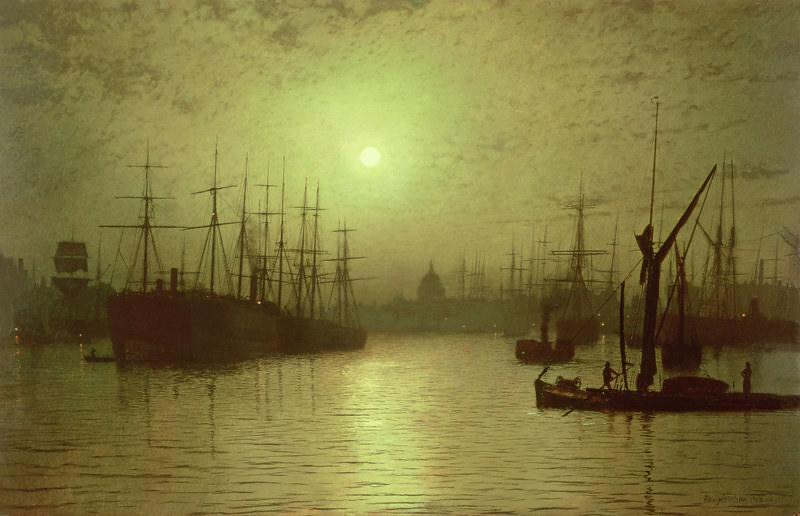 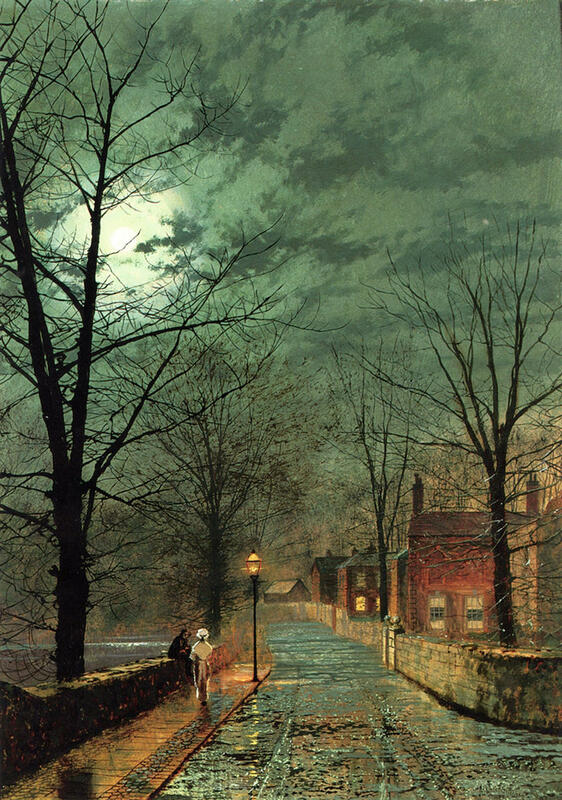 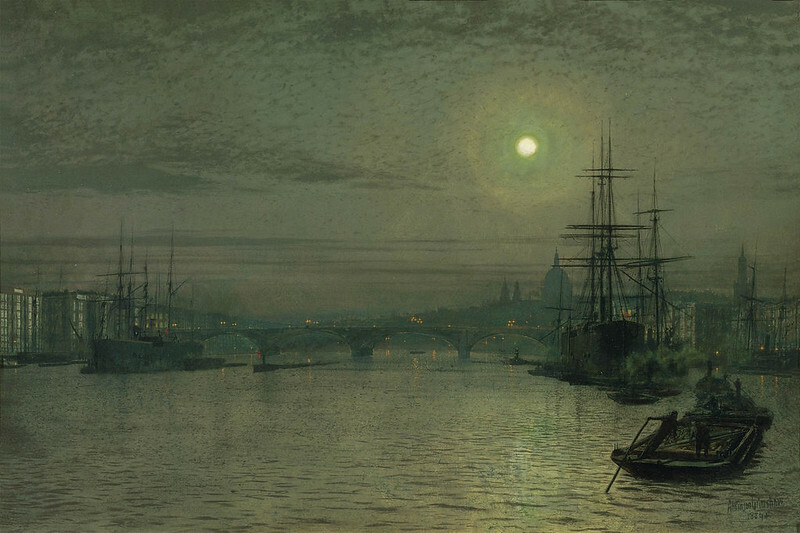 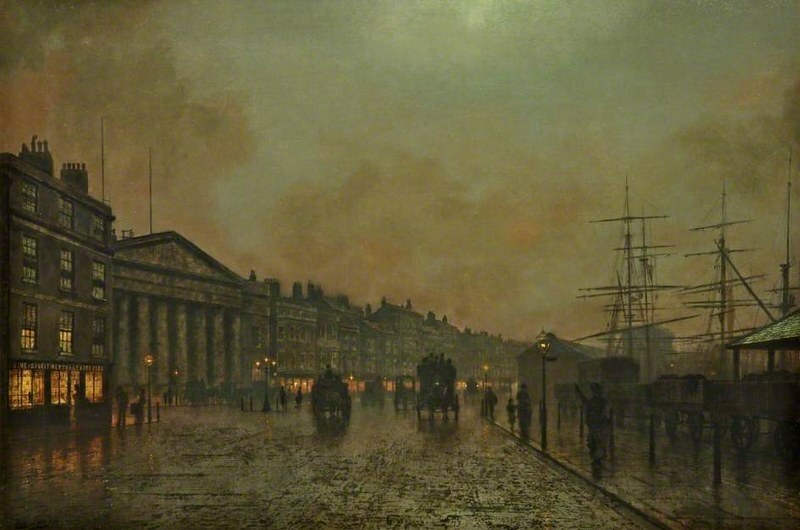 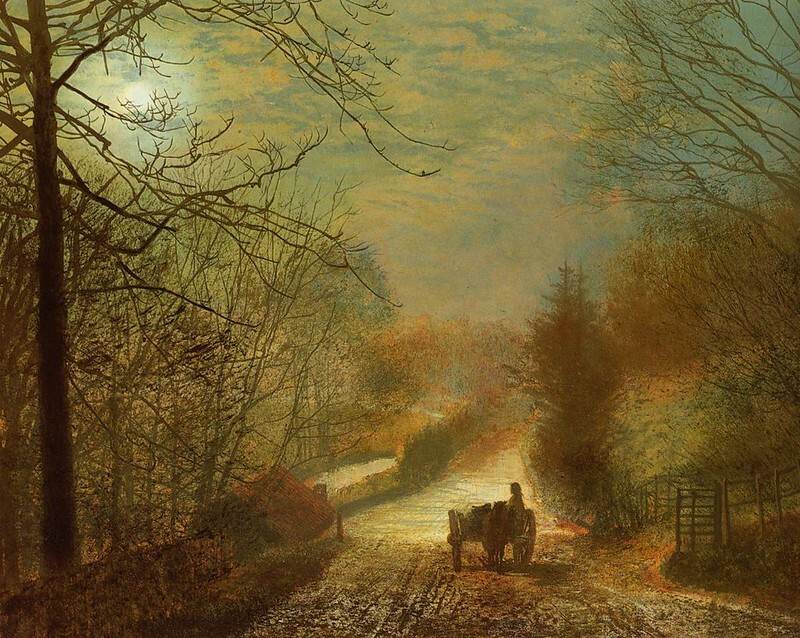 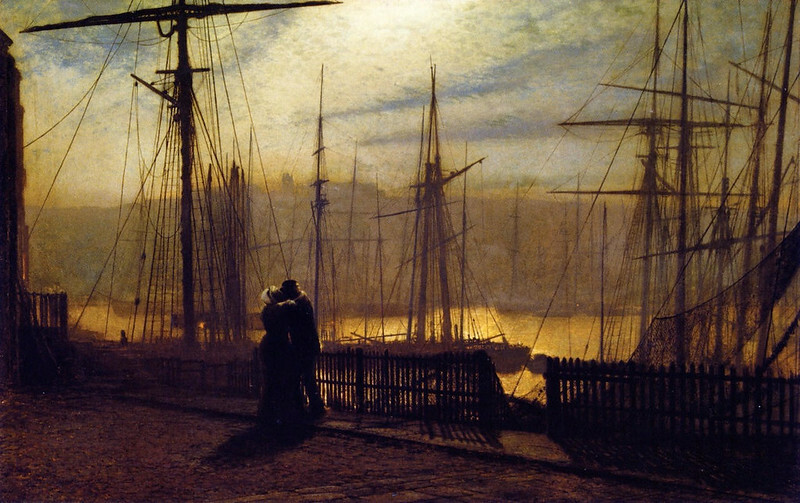 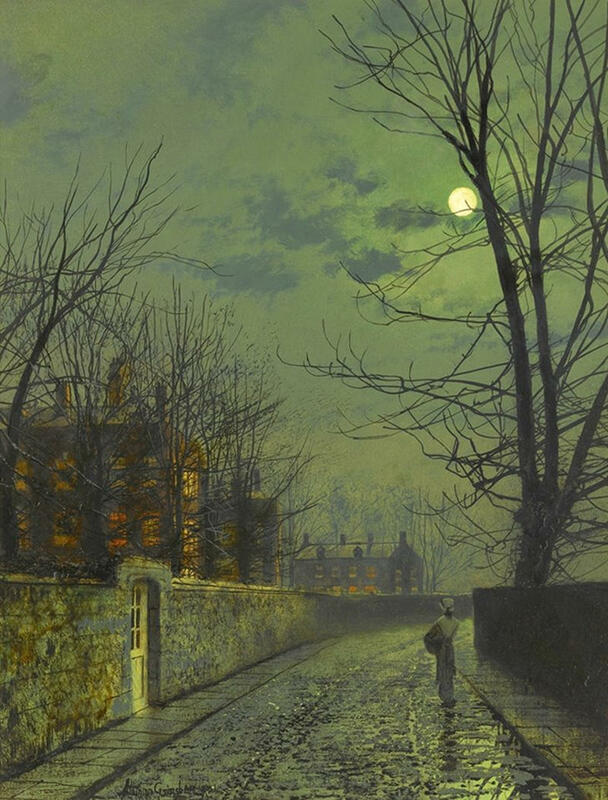 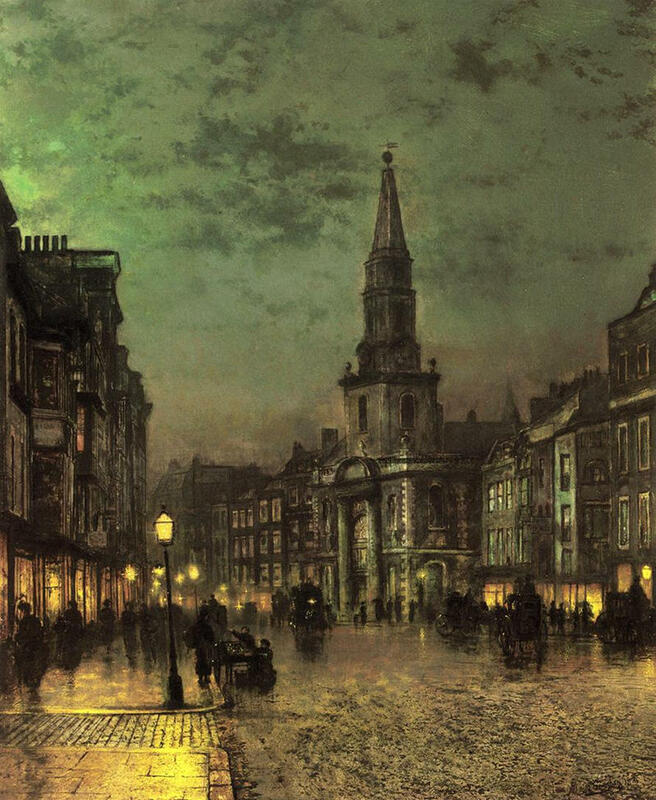 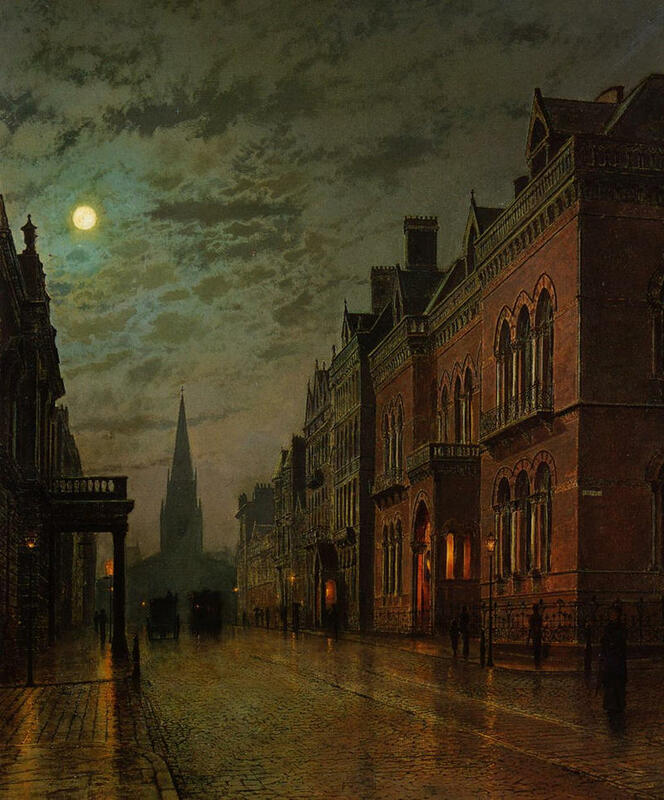 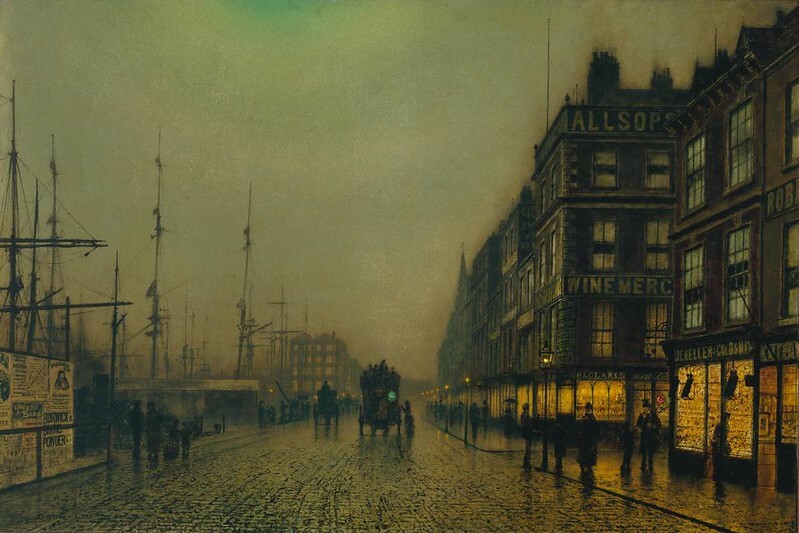 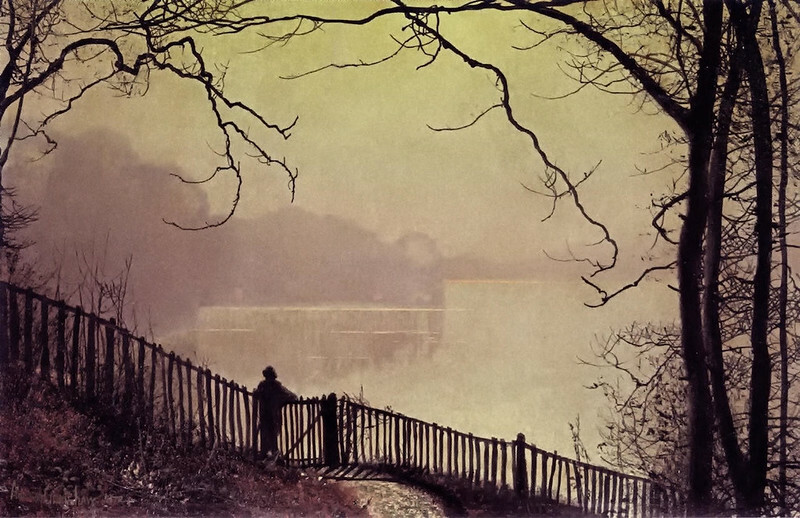 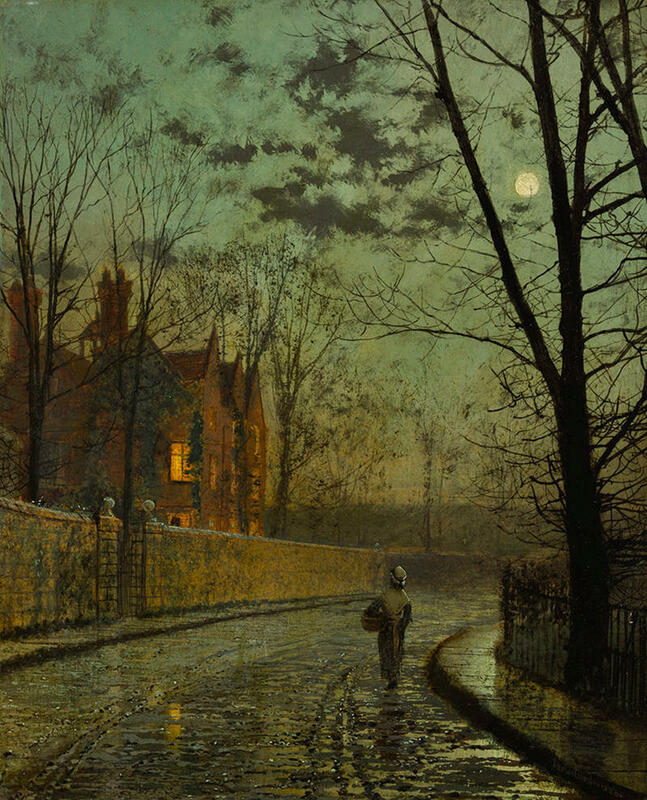 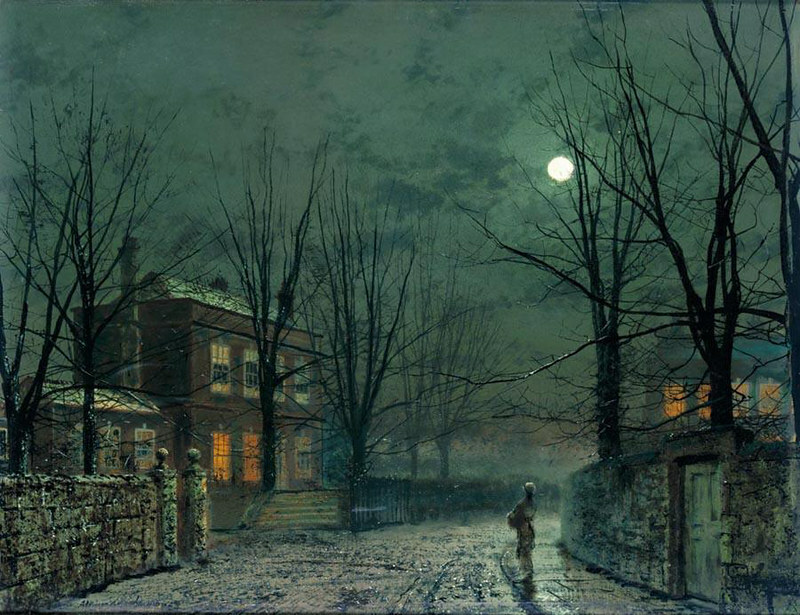 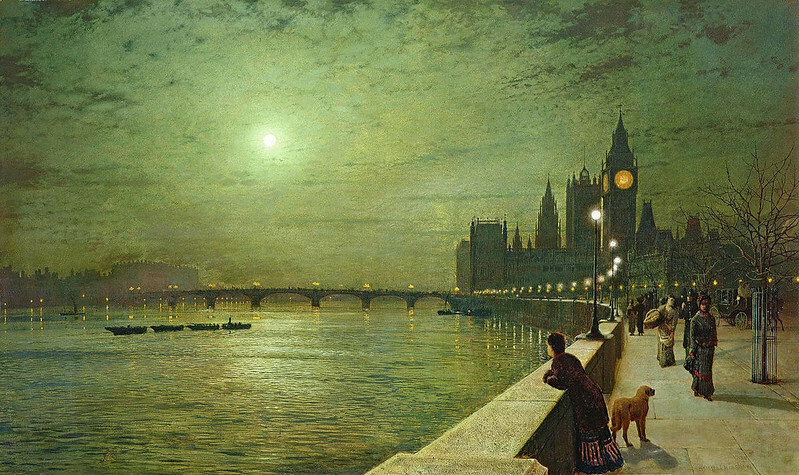 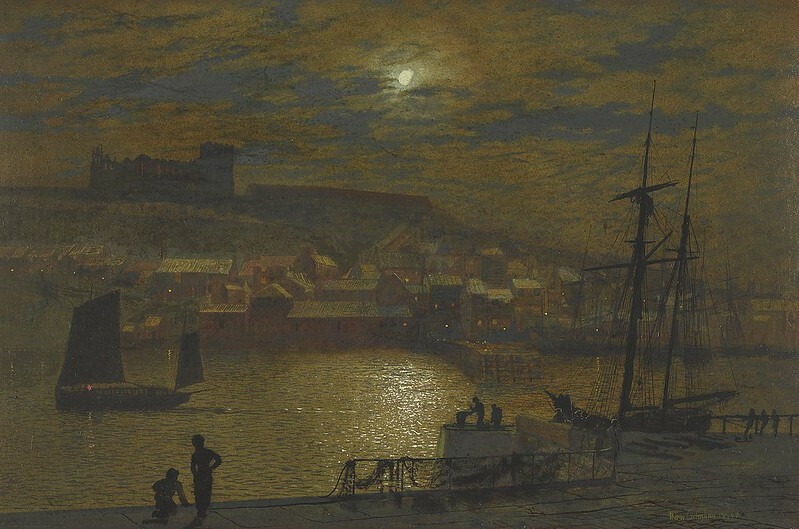 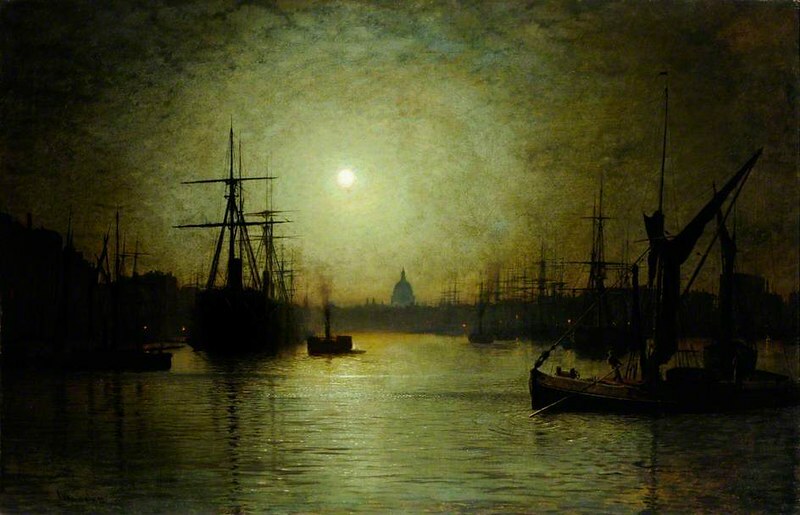 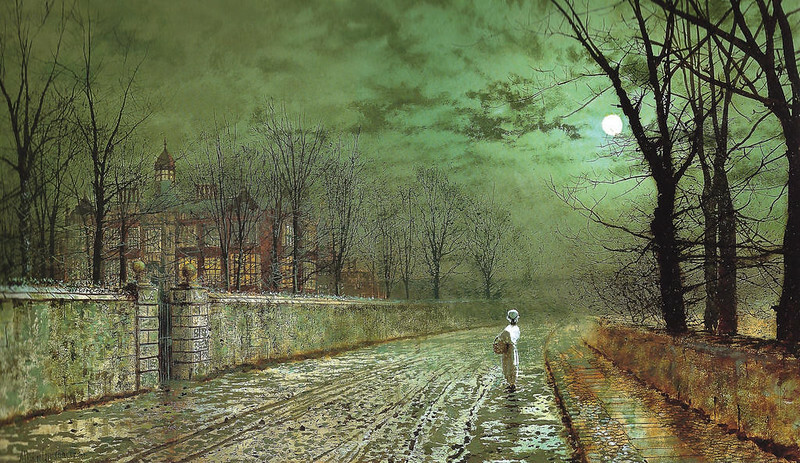 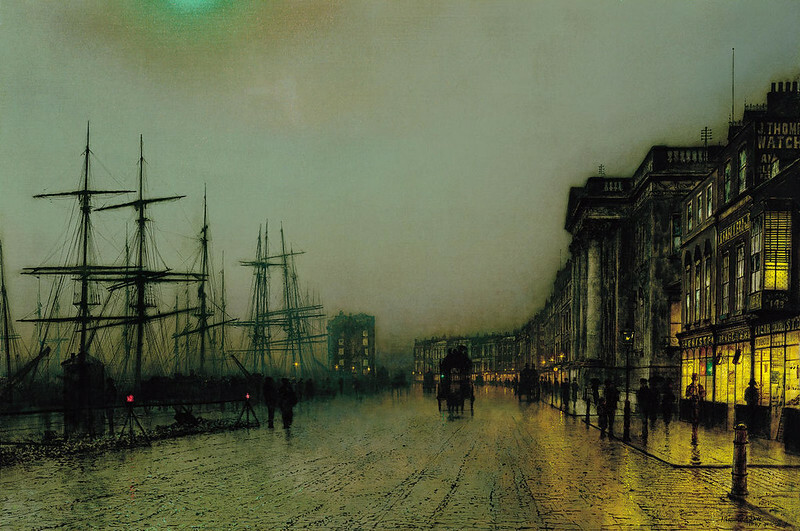 Sharply focused, almost photographic, Grimshaw poetically applied the tradition of rural moonlit scenes to the city, with its rain puddles, mists, and the smoky fog of late Victorian industrial England. 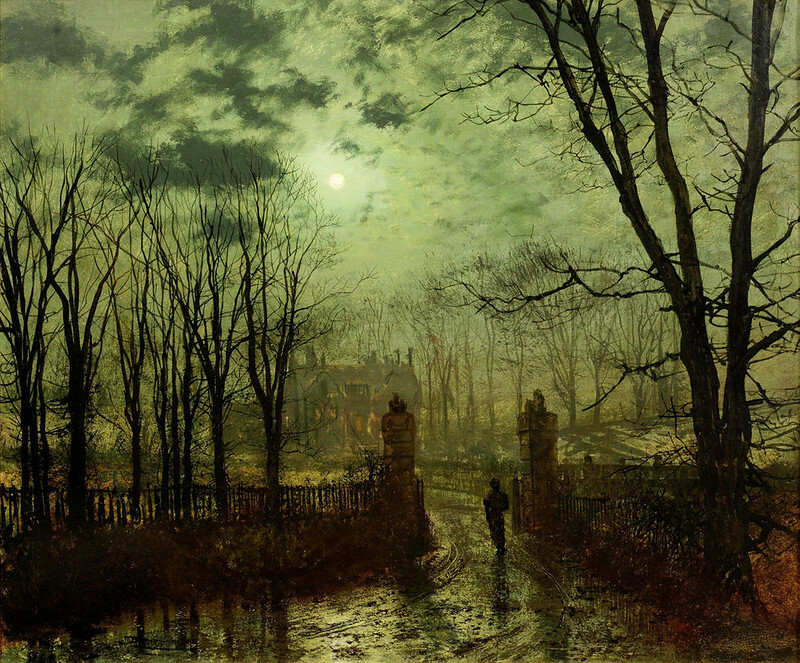 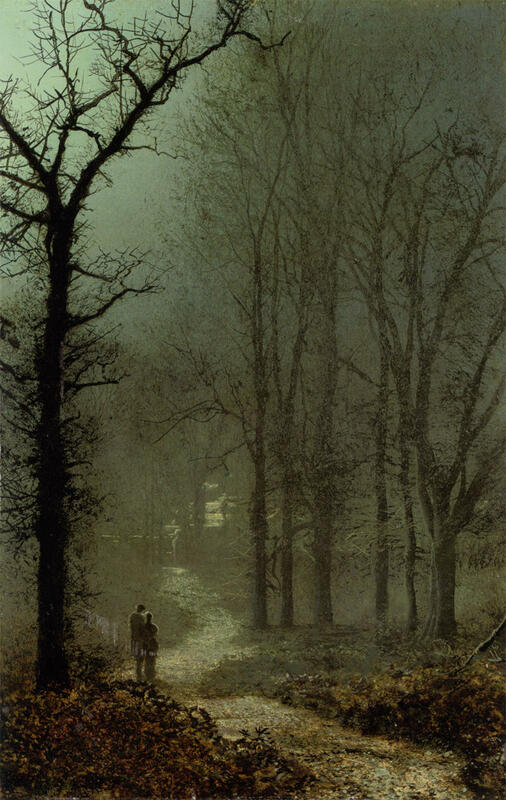 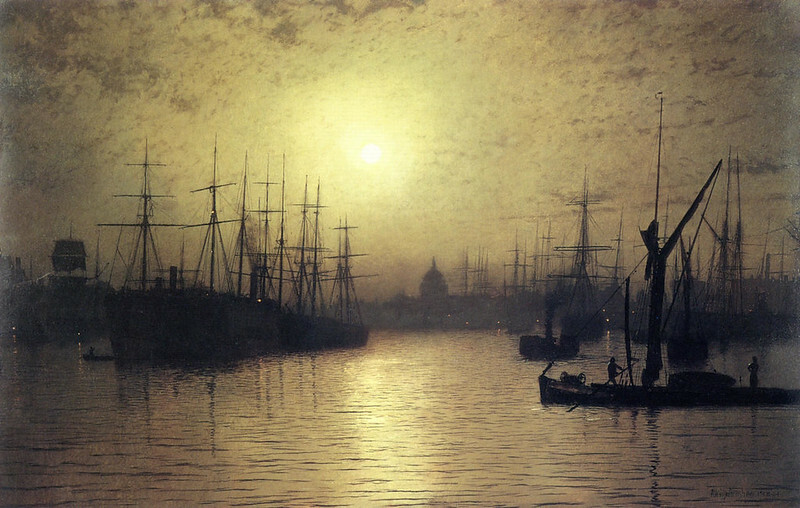 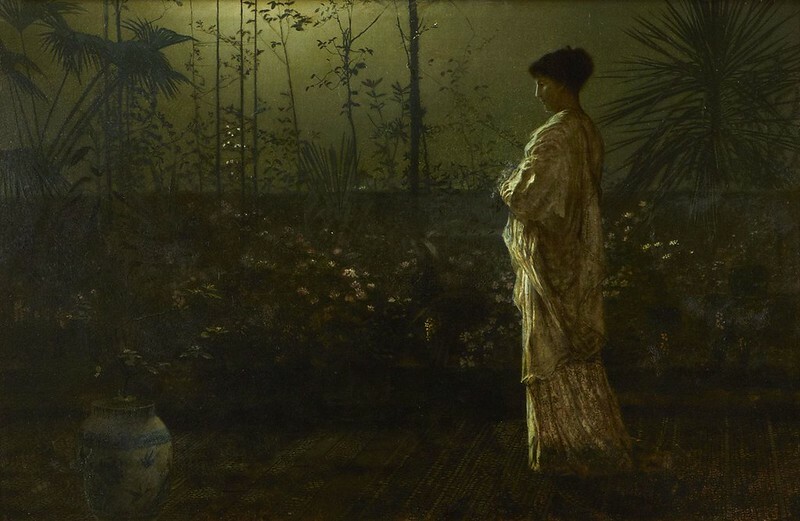 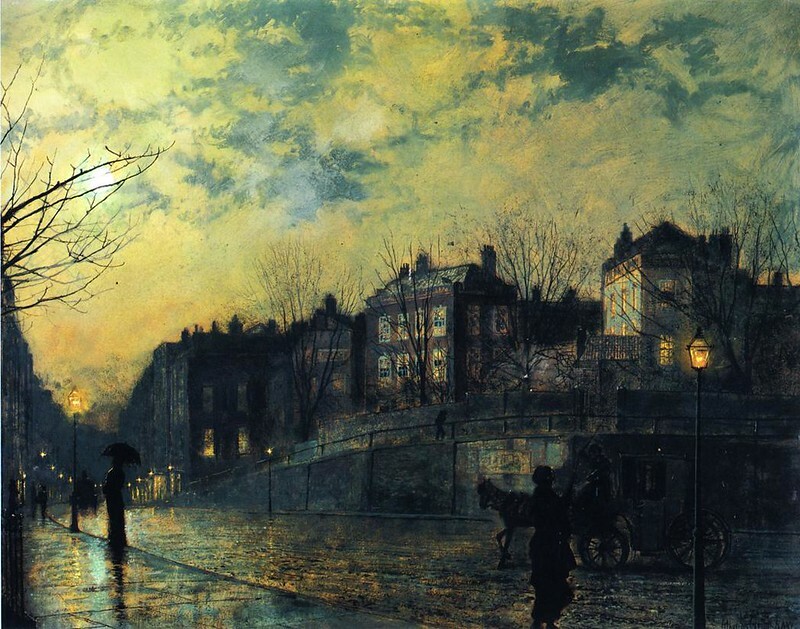 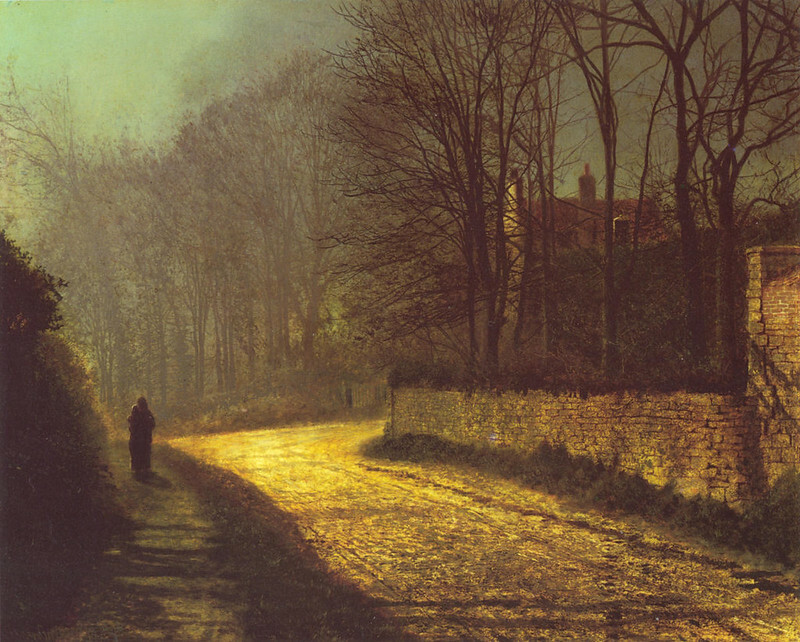 Grimshaw evokes the very feeling of chill in the night air or the damp of mists at dawn’s early light. 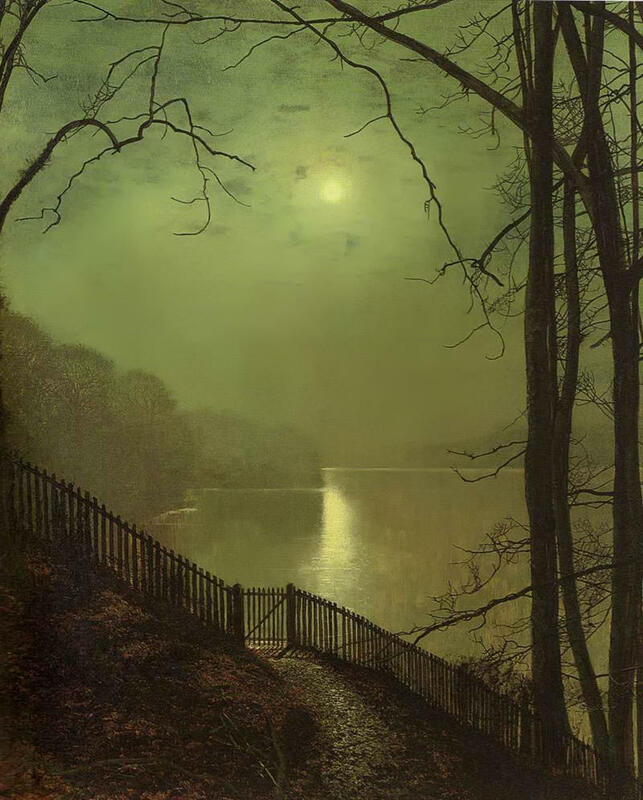 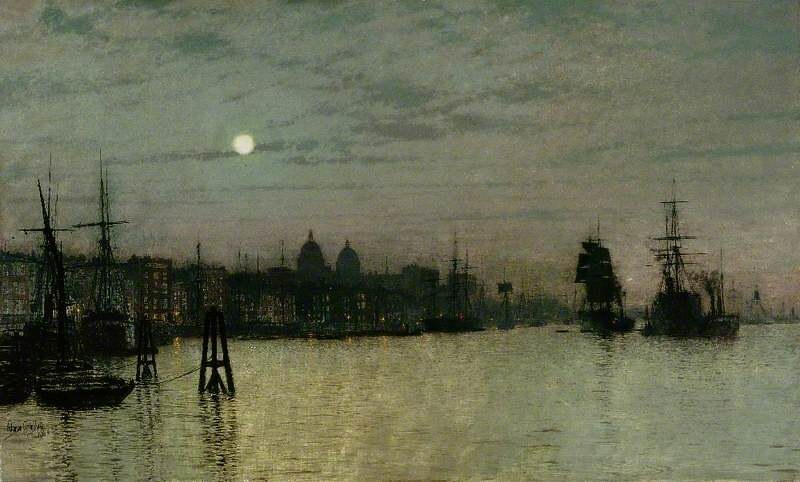 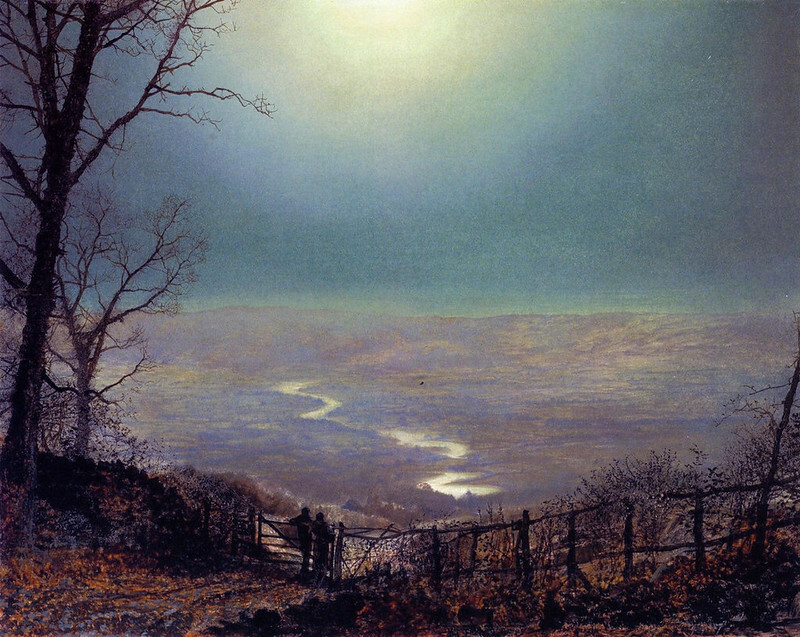 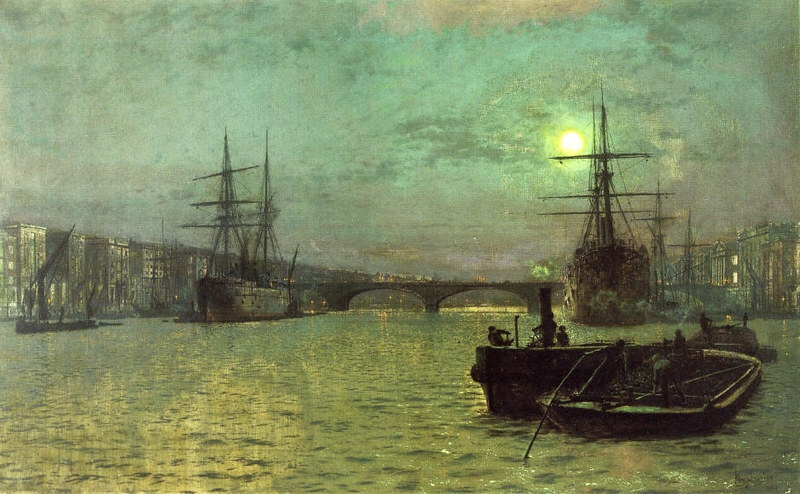 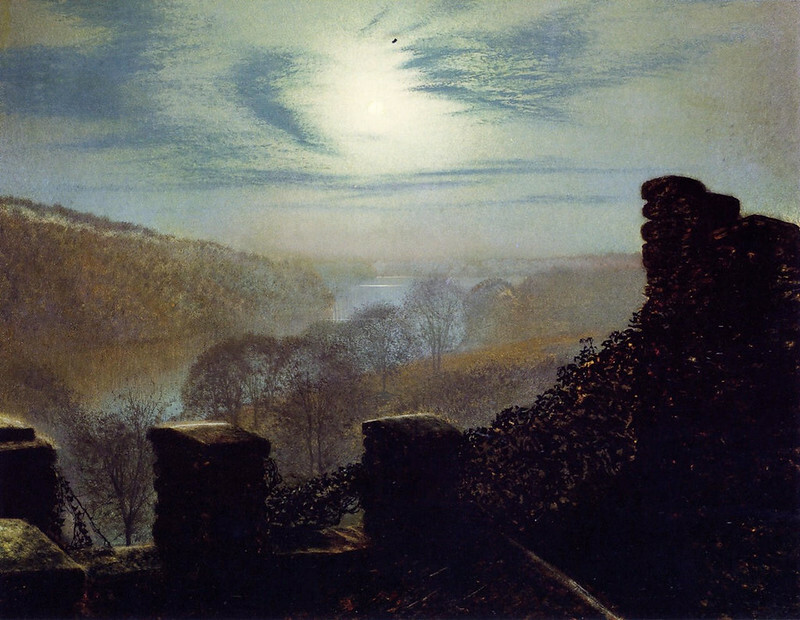 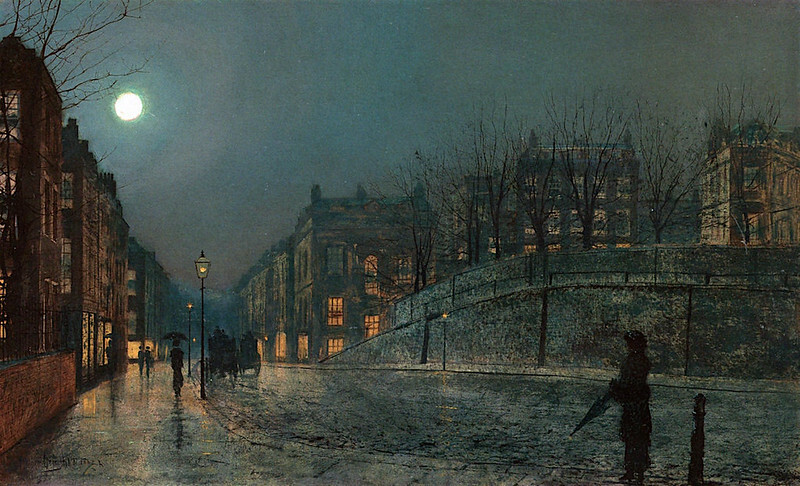 John Atkinson Grimshaw was the Painter of Moonlight.